Note :- If you get errors when installing the hack, It might be because you have previous Flex 2 hacks installed.Go to cydia > installed tap > find the Flex 2 hack packages and remove them. Now try again and install the new deb. Compatibility: Requires iOS 5.0 or later. Compatible with iPhone, iPad, and iPod touch. This app is optimised for iPhone 5, iPhone 6, and iPhone 6 Plus, iPhone 6s, and iPhone 6s Plus. This hack works only if you break first. 1.) Download the app called 8 Ball Pool The Apple-app store for free. 2. )Open Cydia up on your jailbroken Iphone, Ipad and Ipod and search for Flex 2. 3. )Reboot your i device and open 8 Ball Pool And Login . 4. )After Close 8 Ball Pool. 6. )When you are on Flex 2 Go to the second tab (Uploads on Server Cracked) and find the [VIP FREE] 8 Ball Pool Auto Win v3.3.2 by CydiaPlus.com. 7. 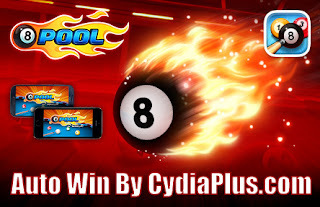 )Click the top file that says "[VIP FREE] 8 Ball Pool Auto Win v3.3.2 by CydiaPlus.com"
8. )Download and make sure the box is tick for the patch. 9. )Now simply switch back to the app and enjoy 8 ball pool auto win hack.